We’re getting into Valentine’s Day making and decorating a little early this year. I don’t understand why I get so inspired by hearts every year, but I do. My kids are all for hearts year round, by the way. This time we painted heart doilies, which we strung together into a Valentines day bunting (with the addition of oil for the suncatcher effect). 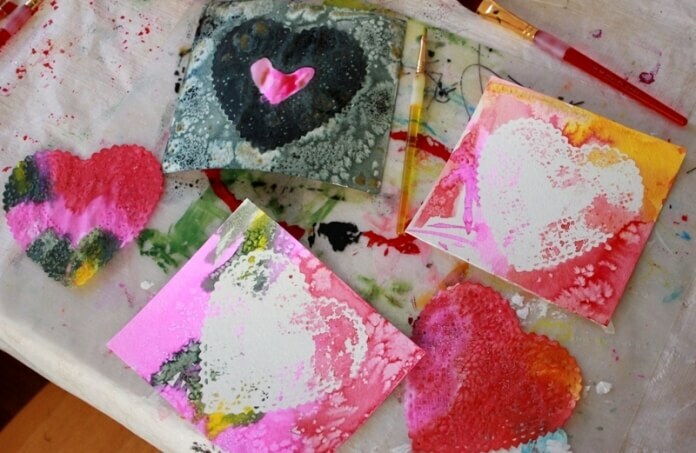 This activity also creates watercolor resist heart paintings that can be used for Valentine’s Day cards or decorations. This painted heart doily bunting came about in a rather circuitous manner. First, we tried doily resist watercolor art with metallic coated round doilies (which worked great), then the same with heart doilies, and finally started painting uncoated white heart doilies inspired by a piece of Daphne’s doily art. Holding the doily in place over the watercolor paper (you can tape it lightly if you like) paint the doily, the paper surrounding the doily, and inside the little holes in the doily. Note :: Make sure you get the uncoated heart doilies rather than the kind that have the shiny coating. The uncoated doilies will soak up the watercolor paint beautifully. The coated kind won’t at all. Continue until the doily and the paper are completely painted. Or just paint the doily, if you’d rather. Maia’s friend Ava painted the details of the doily different colors. (Optional) Add a sprinkle of salt to the wet watercolor paint if desired. Daphne and her friend Cora, above, were very into painting the heart doilies. And very into adding salt. Lift the doily off the paper and let both dry completely. If your kids added stickers as well before painting, pull them off now. The doily (and sticker) resist watercolor paper hearts are beautiful as is. I thought about sewing them together for another kind of bunting, but think we’ll use them as Valentine’s Day cards instead. Turn the doilies over and paint the reverse with a light coat of vegetable oil. This makes them more translucent (for the suncatcher effect) and the colors more vibrant. Use yarn and a yarn needle to sew through the holes at the tops of the doilies, stringing them together into a bunting. Now, hang the bunting in the window where the light can shine through the colorful hearts. Painting the doilies with watercolors is such a simple activity—both for parents to set up and for kids to do—yet the process is fun and the results are beautiful. And if you’re so inclined, use the doily hearts to create a Valentines Day bunting . . .
What are your favorite Valentine’s Day crafts? Leave a comment below! Previous Post Heart Sculptures :: A Great Valentine's Day Craft & Gift! Next Post DIY Heart Shirts for Kids - An Easy Printmaking Project! beautiful! what is that holder you have for the liquid watercolors? that looks cool! i want to try this with my son who is not yet 2 1/2. am i crazy? i’ve looked through your posts tagged under toddler art and they give great suggestions, but i didn’t see any particular art projects specifically for toddlers–maybe for good reason! i am just overly excited to create with him!! thanks! Perfect timing. Now that it’s really close to Valentines day, was looking for a way to have my kids involved. Great post. What is the best painting tip with the vegetable oil, I feel like I am putting too thick of a coat on when I try to paint and it ruins the doilies. Should I use a smaller brush or a cloth. thank you. How lovely the painting is! And the kid is lovely, too! I will teach my child to make this “painted heart”.